I'm trying to create the icon for my iPhone app, but don't know how to get the exact radius that the iPhone's icons use. I've searched and searched for a tutorial or a template but can't find one. I'm sure that I'm just a moron, but how do you get the rounded corners exactly right with your icon from Illustrator or Photoshop? What's the radius for the Retina iPad? You can make four icons (as of today) for your app and they can all have a different look - not necessarily based on the 512x512 image. If you do create a set of custom icons, you can set the UIPrerenderedIcon option to true in your info.plist file and it will not add the gloss effect but it will place a black background under it and still round the image corners with these corner radii so if the corner radius on any of the icons is greater then it will show black around the edges/corners. To add a retina-compatible file, use the same file name and add '@2x'. So if I had a file for my 72x72 icon named icon.png, I would also add a 114x114 PNG file named icon@2x.png to the project/target and Xcode would automatically use that as the icon on a retina display. You can see this in action on the Summary page of the application target if you've done it right. The same works for your launch images. Use launch.png at 320x480 and launch@2x.png at 640x960. After trying some of the answers in this post, I consulted with Louie Mantia (former Apple, Square, and Iconfactory designer) and all the answers so far on this post are wrong (or at least incomplete). Apple starts with the 57px icon and a radius of 10 then scales up or down from there. Thus you can calculate the radius for any icon size using 10/57 x new size (for example 10/57 x 114 gives 20, which is the proper radius for a 114px icon). Here is a list of the most commonly used icons, proper naming conventions, pixel dimensions, and corner radii. Also, as mentioned in other answers, you don't actually want to crop any of the images you use in the binary or submit to Apple. Those should all be square and not have any transparency. Apple will automatically mask each icon in the appropriate context. Knowing the above is important, however, for icon usage within app UI where you have to apply the mask in code, or pre-rendered in photoshop. It's also helpful when creating artwork for websites and other promotional material. I did some tests in Photoshop CS6 and it seems as though 3 digits after the decimal point is enough precision to end up with the exact same vector (at least as displayed by Photoshop at 3200% zoom). The Round Rect Tool sometimes rounds the input to the nearest whole number, but you can see a significant difference between 90 and 89.825. And several times the Round Rectangle Tool didn't round up and actually showed multiple digits after the decimal point. Not sure what's going on there, but it's definitely using and storing the more precise number that was entered. Anyhow, I've updated the list above to include just 3 digits after the decimal point (before there were 13!). In most situations it would probably be hard to tell the difference between a transparent 512px icon masked at a 90px radius and one masked at 89.825, but the antialiasing of the rounded corner would definitely end up slightly different and would likely be visible in certain circumstances especially if a second, more precise mask is applied by Apple, in code, or otherwise. 15.625% is the key percentage here. Multiply any of the image sizes mentioned above in by 0.15625 and you will get the correct pixel radius for that size. With the upcoming release of iOS 7 you will notice that the "standard" icon radius has been increased. So try to do what Apple and I suggested with this answer. Obviously you can change the 120 number with the desired icon size to get the corresponding function. The best approach is not rounding the corners of your icons at all. If you set your icon as a square icon, iOS will automatically overlay the icon with a predefined mask that will set the appropriate rounded corners. If you manually set rounded corners for your icons, they will probably look broken in this or that device, because the rounding mask happens to slightly change from an iOS version to another. Sometimes your icons will be slightly larger, sometimes (sigh) slightly smaller. Using a square icon will free you from this burden, and you will be sure to have an always up-to-date and good looking icon for your app. This approach is valid for each icon size (iPhone/iPod/iPad/retina), and also for the iTunes artwork. I followed this approach a couple of times, and if you want I can post you a link to an app that uses native square icons. So, you can achieve whatever effect you want just drawing a plain square icon and filling content in it. The final corner radius will be something similar to what the other answers here are saying, but this will never be guaranteed, since those numbers are not part of the official Apple documentation on iOS. They ask you to draw square icons, so ... why not? (path is for recent versions of XCode. For older version it will probably be inside /Developer/). As others have noted, you should NOT mask them yourself, but you can use these to check how your icons will look once masked. People arguing about the corner radius being slightly increased but actually that's not the case. The corner radius of the 57 x 57 pixel icon is 9 pixels. As others have said, you don't want to round your corners. You want to ship flat (no layers or alpha) square graphics. Apple changed the mask they use for rounding your corners in iOS7 and then again in iOS8. You can find these masks inside your Xcode application bundle. The path changes with every new SDK version they release. So, I'll show you how you can always find it. At this very moment, the path found by that command is /Applications/Xcode.app/Contents/Developer/Platforms/iPhoneSimulator.platform/Developer/SDKs/iPhoneSimulator.sdk/System/Library/PrivateFrameworks/MobileIcons.framework but don't trust that. Use the command to find it yourself. You can use that to test your icon to see if it will look okay after it is masked. But, don't round your corners. If you do, when Apple changes those masks again, you will have artifacts. If not considering stroke, the exact radius is actually 10px for 57x57 icon. I get this info from iconreference. 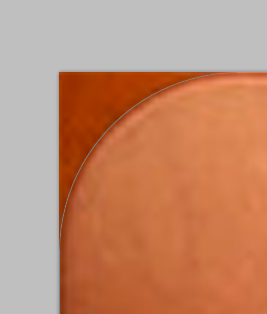 When designing my app icons with Photoshop, I have found that no integer corner radius fits the device's mask exactly. What I do now is create an empty project with Xcode, set a completely white PNG file as the icon, and turn off the preset bevel & gloss. Then, I run the app and take a screenshot of the home screen. Now, you can easily create a mask from that image, which you can use in Photoshop. This will get you perfectly rounded corners. There are two totally conflicting answers with large number of votes one is 160px@1024 the other is 180px@1024. So witch one? I ran some experiments and I think that it is 180px@1024 so drbarnard is correct. 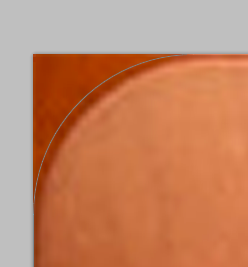 I downloaded iTunes U icon from the App Store it's 175x175px I upscaled it in photoshop to 1024px and put two shapes on it, one with 160px radius and one with 180px. As you can see below the shape (thin gray line) with 160px (the 1st one) is a bit off whereas the one with 180px looks just fine. I create a canvas sized 1026x1026px with a 180px mask for main design Smart Object. I duplicate the main Smart Object 5 times and resize them to 1024px, 144px, 114px, 72px and 57px. I put a "New layered Based Slice" on each Smart Objects and I rename slices according to their size (e.g. icon-72px). When I save the artwork I select "All User Slices" and BANG! I have all icons necessary for my app. You don't need to apply corner radius to your app icon, you can just apply square icons. The device is automatically applying corner radius. Not the answer you're looking for? Browse other questions tagged iphone ios ipad icons or ask your own question. iphone large icon 512x512 with border glitch? How do I specify an iPad Retina icon in XCode 4.3 for an iPhone-only app? Where do I have to put App Images and Toolbar Icons in iOS Project?